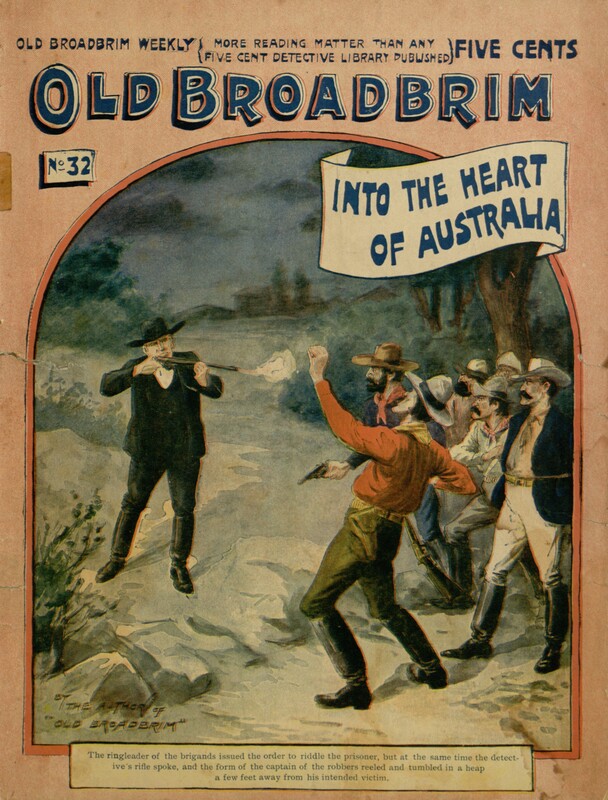 This week’s eBook release (completed with the help of the Distributed Proofreaders project) is Old Broadbrim Into the Heart of Australia, the thirty-second issue of Old Broadbrim Weekly, a publication chronicling the adventures of a Quaker detective. In this particular adventure, Old Broadbrim tracks a villain all the way to Australia while investigating a pair of murders. Unlike many dime novels, which tend to be filled with exaggerated dialect and broad stereotypes, this adventure is a bit unusual for portraying all of its characters very similarly. Everyone speaks fairly formally (even the Australian Aborigine), with the only verbal tic being Old Broadbrim’s occasional use of “thee” and “thy.” Men and women alike engage in fights, commit murders and find themselves controlled by one another. This is not to say that Old Broadbrim offers a Utopian view of human equality (there’s far too much death and insanity for that), but it does subvert expectations. One might also be curious about how a Quaker detective differs from any other sort of detective. The answer, at least for this book, is hardly at all. Apart from the aforementioned “thees” and “thys,” Old Broadbrim acts like any other dime novel detective, shooting people, drinking alcohol and hoping to place his quarry on the end of a rope. If you are interested in reading the whole book for yourself, you can find it on Project Gutenberg, where it may be read online or downloaded in various common eBook formats.